Everything else should wait. But expressing your love for your brother shouldn't. On this Raksha Bandhan, opt for FlowerAura’s express same day Rakhi delivery in India and convey your love, affection, and care for your brother just on time. This sweet gesture is sure to make your doting brother feel special and loved. With the pious festival of Raksha Bandhan just around the corner, we know what you are dealing with. You have tied the sacred thread around your brother's wrist for years but now he is in another city. Right? But, it is the unbreakable bond which makes you call him whenever something goes inappropriate in your life. In fact, it is the bond which makes you call him even when something is going awesome in your life. It is the bond which reciprocates happiness, love, tears of joy and memories of innumerable fights. We understand the flow of emotions completely. And, therefore, FlowerAura brings to you its Rakhi express delivery in India via which you can send Rakhi online to your brother. For your little monster, you can send kids Rakhi online as well along with the decorated thali, sweets, and gifts through FlowerAura's online Rakhi express delivery. You must have waited every year for the festival of Rakhi and so you do this time. The only difference is that today your brother is in another city. But don't you worry about express delivery of Rakhi, you can celebrate the festival with your brother even when miles apart. We have the best combos for Rakhi puja thali online, Rakhi with sweets and gifts. 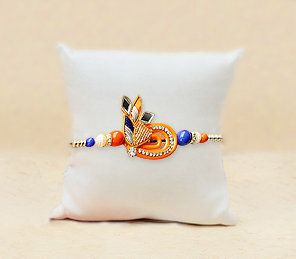 We assure to send Rakhi on the same day. You need not worry about the timely delivery with us. We understand your sentiments attached to every moment of the day. Hence, we make sure to that the feelings you have for your brother are wrapped in the Rakhi especially ordered for him and reach the destination in time. So get your hands on FlowerAura's Express Rakhi delivery and make the day a fulfilling memory. Just the heading is enough to bring back the best memories of childhood. If there is one relation you can rely in this world other than your parents it is that of your sibling. You must have fought innumerable times during childhood, taken sides and shared the deepest secrets. How could you not? Even before you understood the meaning of Rakhi, your brother always stood by you and you his sister loved him unconditionally. And haven't you decorated the pooja thali every year and the best Rakhi for brother online to send with instant home delivery free shipping. He too has boasted to his friends about the same. You are pondering as to what to do when today your brother is in another city. Well! We understand the strong emotion and bond which celebrates the festival. All you need to do is click on our website and choose the best combination of Rakhi, sweets, chocolates and gift. We assure timely delivery of the same! To enjoy Rakhi online same day delivery , just log in to our website, choose a Rakhi for your brother and place your order. Once your order gets placed, we will ensure you a doorstep delivery on the same day. If you are residing away from India and find it difficult to celebrate this auspicious occasion with your brother, FlowerAura is here to provide you assistance. You have an option of same day Rakhi delivery to India from USA, UK, Australia, Canada, UAE, Dubai, Germany, Singapore, Saudi Arabia. Now, distance is no more an issue when you can Especially if you are looking for an option of Express delivery, FlowerAura gives you a very convenient option to send Rakhi to India on Same day from across the world. In fact, if you are blessed with a sister who lives away from you in a different city then, you can send Rakhi gifts for sister from FlowerAura and make your presence felt. Now, you can sit at the ease of your home and order for some scintillating Rakhi collection from FlowerAura and celebrate the spirit of the occasion. Now that you are far off, make sure the sweet sibling bond does not weaken. The childhood memories and the grown up dreams that you both have shared ought to be recognised on a special day of Rakshabandhan to let your brother know how much you care for him. No matter in which part of this world does your brother live, you can now avail online Rakhi same day delivery in India and send your love tokens for your brother. If you are ordering at the last moment and want an immediate delivery on this Raksha Bandhan, you can avail our Express Delivery Service with today Rakhi delivery. We are covering more than 200 cities across India, so order worry free, we guarantee on time delivery. Adampur, Agra, Ahmedabad, Ahmednagar, Ajmer, Akola, Akole, Aligarh, Allahabad, Alwar, Ambala, Ambarnath, Ambikapur, Amravati, Amritsar, Anand, Asansol, Aurangabad, Bangalore, Bareilly, Baroda, Bathinda, Beawar, Begusarai, Belgaum, Bhagalpur, Bharatpur, Bhavnagar, Bhilai, Bhiwadi, Bhiwani, Bhopal, Bhubaneswar, Bhuj, Bikaner, Bilaspur, Bokaro, Budaun, Calicut, Chandigarh, Chengalpattu, Chennai, Cochin, Coimbatore, Cooch Behar, Cuttack, Darbhanga, Dehradun, Delhi, Deoghar, Dera Bassi, Dhanbad, Durg, Durgapur, Erode, Faizabad, Faridabad, Fatehgarh Sahib, Firozabad, Gandhidham, Gandhinagar, Ghaziabad, Goa, Gorakhpur, Goraya, Greater Noida, Gurdaspur, Gurgaon, Guwahati, Gwalior, Haldwani, Hapur, Haridwar, Hisar, Hooghly, Hoshiarpur, Howrah, Hubli, Hyderabad, Indore, Jabalpur, Jaipur, Jalandhar, Jalgaon, Jalna, Jammu, Jamnagar, Jamshedpur, Jhansi, Jharsuguda, Jodhpur, Kalka, Kanchipuram, Kanpur, Kapurthala, Karnal, Kashipur, Khanna, Kharagpur, Kharar, Kolhapur, Kolkata, Korba, Kota, Kurukshetra, Latur, Lucknow, Ludhiana, Manesar, Mangalore, Manipal, Mapusa, Margao(Goa), Mathura, Medinipur, Meerut, Mobor, ModiNagar, Moga, Mohali, Moradabad, Mumbai, MuradNagar, Muzaffarnagar, Mysore, Nagercoil, Nagpur, Nanded, Nasik, Navalur, Navi Mumbai, Noida, Ooty, Panaji, Panchkula, Panipat, Panvel, Parbhani, Pathankot, Patiala, Patna, Phagwara, Pilibhit, Pondicherry, Pune, Raebareli, Raigarh, Raipur, Rajkot, Rajpura, Rampur, Ranchi, Raniganj, Rewari, Rishikesh, Rohtak, Roorkee, Ropar, Rourkela, Rudrapur, Saharanpur, Sahibabad, Salem, Sambalpur, Sangamner, Sangli, Secunderabad, Shimla, Shrirampur, Sikar, Siliguri, Singrauli, Sinnar, Solan, Solapur, Sonipat, Surat, Tarn Taran, Thane, Trichy, Trivandrum, Udaipur, Udupi, Ujjain, Vadodara, Vapi, Varanasi, Vasco, Vellore, Vidyanagar, Vijayawada, Vizag, Waidhan, Yamunanagar, Yavatmal, Zirakpur, etc.